2. VW Concept Blue Sport | What Car? 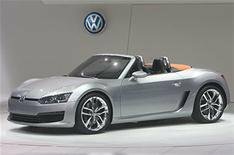 The mid-engined roadster that Volkswagen inexplicably dropped from its stand in sunny Los Angeles last November was finally revealed in snowy Detroit and immediately became one of the hits of the show. Called Concept Blue Sport, it is powered by a 180bhp 'clean' diesel engine of unspecified size and is based upon the VW Group's small-car architecture that underpins the Seat Ibiza and will be used for the next Polo. Dr Wolfgang Hatz, head of engines for the group, hinted that there is a good chance the roadster will make it through to production. 'It was always in our minds that we might use the platform for a car with the engine at the rear, which is why we designed it in a modular way,' he said. Details of the Blue Sport are sketchy, though VW did say it has a six-speed DSG twin-clutch semi-automatic gearbox, accelerates from 0-62mph in around 6.5secs and is capable of more than 65mpg, with CO2 emissions of just 113g/km. It features stop-start and brake energy regeneration to lower its diesel consumption. It appears at Detroit in silver metallic with an orange canvas roof and rides on 19-inch wheels. Group chief designer Walter de Silva says the styling has been 'reduced to essentials' but that it reflects the new design language VW introduced on the Scirocco and the latest Golf.